A lawsuit has been filed against the National Football League and NFL Commissioner Roger Goodell in the wake of the New Orleans Saints loss to the Los Angeles Rams in the NFC Championship Game. The case has “literally 0 chance of success. 0% 100% minus 100%. It is dead on arrival,” says appellate lawyer Raffi Melkonian. I would have a hard time telling Melkonian he is mistaken. The plaintiffs are upset about the non-call that you have undoubtedly seen countless times by now. 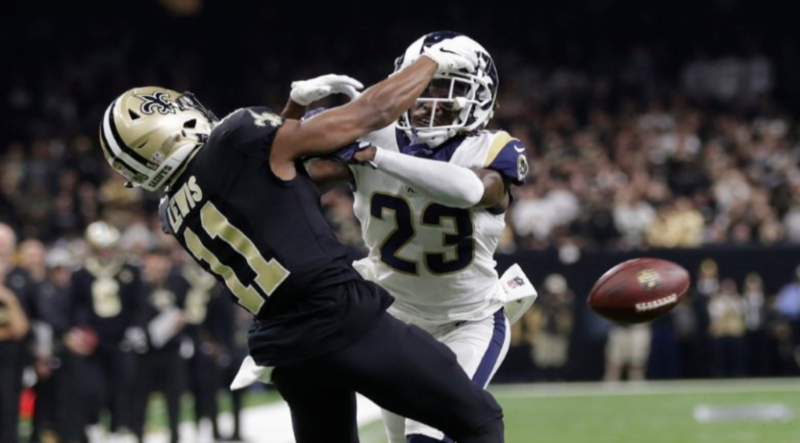 A Rams defensive back clearly committed pass interference and made helmet-to-helmet contact with the Saints receiver. Yet, there was no call on the play, which led to a Rams win and the Saints losing the right to participate in the Super Bowl. The dispute is grounded on a cause of action for negligence. What damages, you may ask. The plaintiffs seek damages related to mental anguish and emotional trauma, loss of faith in the NFL, loss of enjoyment of life, loss of entertainment, distrust of the game and other damages to be itemized at trial. They would also either like the game to be replayed, or at least have the final moments of the game played again. Expect the court to refuse to intervene in what is strictly an NFL matter. Judges have, in the past, declined to involve themselves in errors committed by referees, even when the error “could be considered by mange as a tragedy.” I suspect many Saints fans would feel the same in this case, but it is a case that is not worthy of judicial resources.